Universitas Gadjah Mada (UGM) sent another team to Palu in Central Sulawesi on Monday (5/11). As many as 17 volunteers will stay for nine days in Lolu village, Biromaru district, Sigi regency. They are 14 students from Faculty of Cultural Sciences, Vocational School’s Nursing Department, and Psychology, accompanied by three lecturers from UGM and Kagama. They will all help with the mitigation efforts for disaster impacted people, beginning from 6-14 November 2018, focusing on health, education, and clean water procurement. UGM Director for Community Service, Prof. Irfan Dwidya Prijambada, asked the volunteers to make good contributions to the impacted people. He hoped what they did do would benefit the community and be a lesson for themselves. “What you do in Palu hopefully would benefit the community and yourself,” he said. Irfan added the dispatchment of students this time was the third done by UGM to help the people impacted by the disasters that struck Palu. Previously, UGM sent a medical team to help during the emergency response. 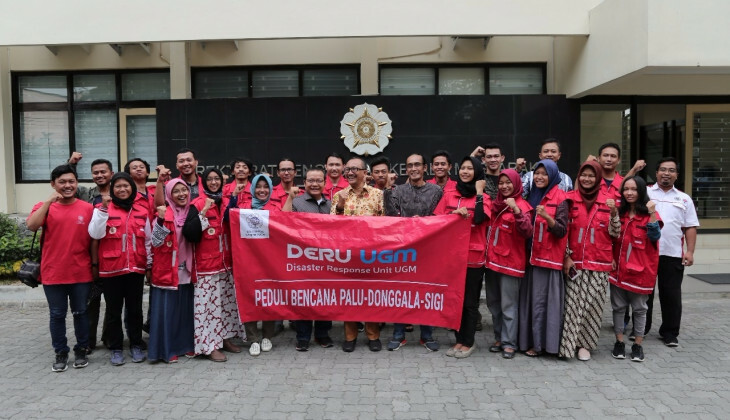 In this mission, said Irfan, UGM through Disaster Response Unit (DERU) collaborated with alumni association, Kagama. The collaboration has been done for the past three years in terms of volunteers, aid, and student community service. “Apart from sending volunteers, we will also send a student community service team to Palu in Desember 2018,” he said.